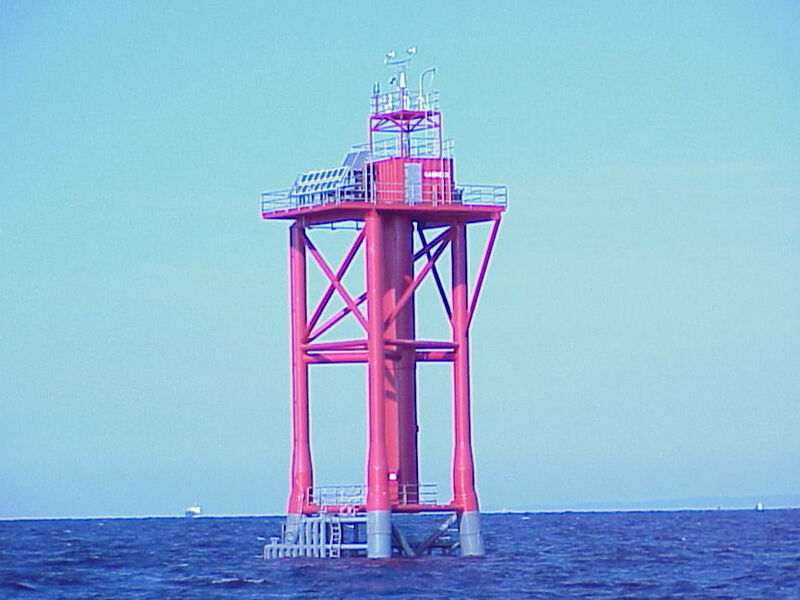 The Ambrose Light-tower is situated in 70 feet of water 7.4 miles east of Sandy Hook. The tower went into operation August 23, 1967. It is made of prefabricated sections that were floated to the site on barges from Norfolk, Virginia. The Texas-tower structure is supported by a framework of four 42 inch diameter steel pipe legs. Cross braced with 18 and 20 inch diameter steel pipes the structure is designed to withstand even the worst hurricane. The station cost 2.4 million dollars to build. The platform is two decks high. The lower deck housed the fuel and water tanks. The upper deck provided living quarters for the 6 permanently assigned Coast Guard members and had room for 3 transient members. Four crew members were on duty at all times. Crew menbers served two weeks on the platform before getting a week off. 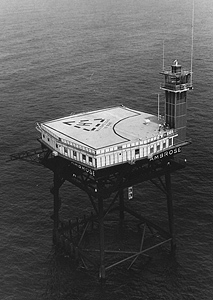 The roof of the platform served also as a heliport. The main light tower juts from the southeast corner of the platform roof. The focal plane of the light is about 136 feet above men low water. The 10,000,000 candle-power light could be seen about 18 miles. The characteristic of the light is white group-flashing, with three flashes every seven and half seconds. The crew was permanently removed from the station on March 15, 1988. The light-tower is now controlled electronically from the Coast Guard station on Governor's Island.